For the above mentioned reason we all have heard of people asking “Ganga Snanam aacha?” during the Diwali festival, but our puranas have mentioned about another kind of snana / bath. Let see what it is! No. 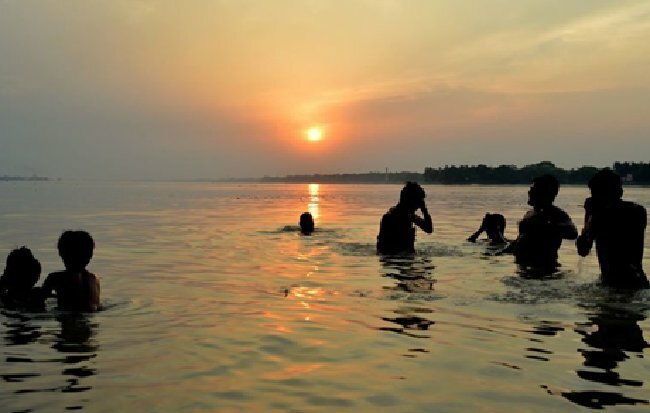 1 The Ganga Snanam. Especially on Diwali day people wake up before sunrise, Pray to God and apply sesame oil and take bath in Hot water before the sunrise. Infact, it is said that Diwali is the only day where in people can have an oil bath before sunrise! The deity, Lord Vishnu is meditated on while during the Ganga snana and River Ganges herself is believed to be present in the water that we bath. No 2. The Thula Snanam. 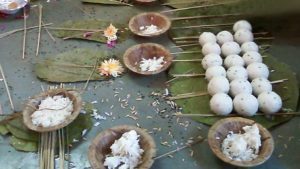 The Thula snanam is performed 6 nallikai after sunrise, in IST it is approximately at 9.am. In any of the rivers like Cauvery, pond, well or any ground water. Here, Lord Shiva is meditated upon while taking bath. Team IshtaDevata Wishes one and all a happy and Safe Diwali!! 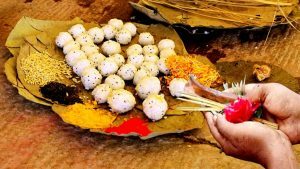 Stories and Legends of Diwali Festival – Part II Dhumavati – One of the Dasamaha Vidhyas Vaikuntha Chaturdashi – Worship of Lord Shiva and Vishnu Why do we offer food as prasadam to God? ஏன் நாம் உணவை இறைவனுக்கு பிரசாதமாக படைக்கின்றோம்?